Roses are the ultimate way of expressing emotions and love. Red rose for love, a yellow rose for friendship and white rose for peace. If all these are combined together they form a spellbind bouquet. This is surely the bouquet for all those mixed feelings and values of the inner you. This bouquet was formed for the bonds which are lovely, adventurous, joyful and pleasant. 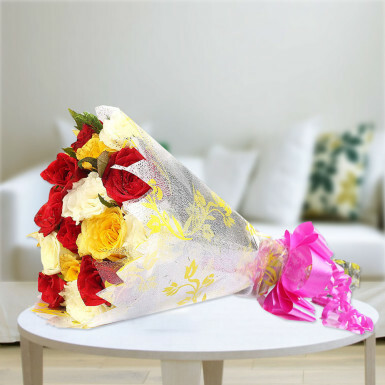 This 20 multicolor rose bouquet is formed with the combination of lovely red roses, elegant yellow roses, and peaceful white rose. The combination is mesmerizing and in packed in beautiful paper packing with a ribbon. Flowers are ruling hearts since ages and are used for the expression of various emotions. The emotions which cannot be expressed in words are expressed with this beautiful flower bouquet. This is best flower bouquet for friendship day, anniversary gift, birthday gift, teacher’s day gift, good bye gift, success party present and much more. I really want to thanks Winni as they have delivered my product at the right time. The flowers were fresh and the packing was also great. I will suely visit Winni again for future orders. Awesome delivery They haven't even contacted from the time of order booked till delivery which is very much appreciated bcz many people will b buzy and can't answer the calls. And very timely delivery. I recommend it to my frndz also. Simply loved it. But need to add much more.